Hisser death, turned white almost like mold? Dying hisser. Is there anything else I can do? Grain Mites ? What do they look like and how to get rid of them? 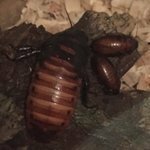 Worms came out of dead roach?